Roughly 10 percent of that land was then used to grow soy, a native vegetation conversion of at least 21,000 square kilometres (with over 17,000 of that in the Cerrado), according to the Stockholm Environment Institute (SEI) and Global Canopy’s Trase platform, which analyze commodities supply chains. Clearing native vegetation releases carbon dioxide and other greenhouse gases, while crop plantations store less CO2 – a one-two punch hindering efforts to curb climate change. About 140,000 square kilometers of Cerrado were lost from 2006-2017, releasing 210 million tons of carbon dioxide equivalent emissions (CO2e). The majority of Brazil’s soy is produced for export. 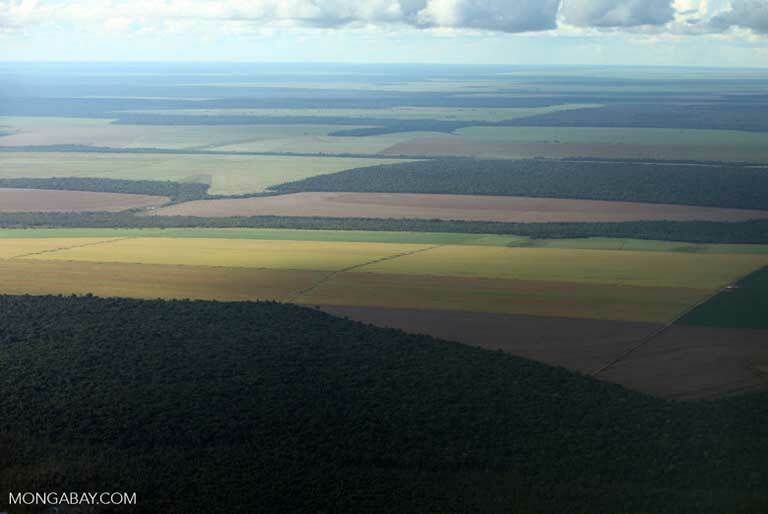 So experts say the best way to protect the Cerrado under the Bolsonaro administration will be for commodities companies and NGOs to create market incentives. Plans now under consideration suggest momentum is building to protect Brazil’s most vulnerable ecoregion. More than 17,000 square kilometers (6,500 square miles) of the Brazilian Cerrado biome’s native vegetation has been cleared for soy plantations in the last 11 years, according to an analysis conducted by the Stockholm Environment Institute (SEI) and Global Canopy – two international NGOs. The Cerrado biome – a rich patchwork of forest, savanna and grassland originally covering 2 million square kilometers (790,000 square miles) in central and northeast Brazil – is home to roughly 5 percent of the world’s biodiversity. But in recent decades, the region has also been at the heart of the world’s biggest agribusiness boom, and has lost roughly half of its original native vegetation as a result. 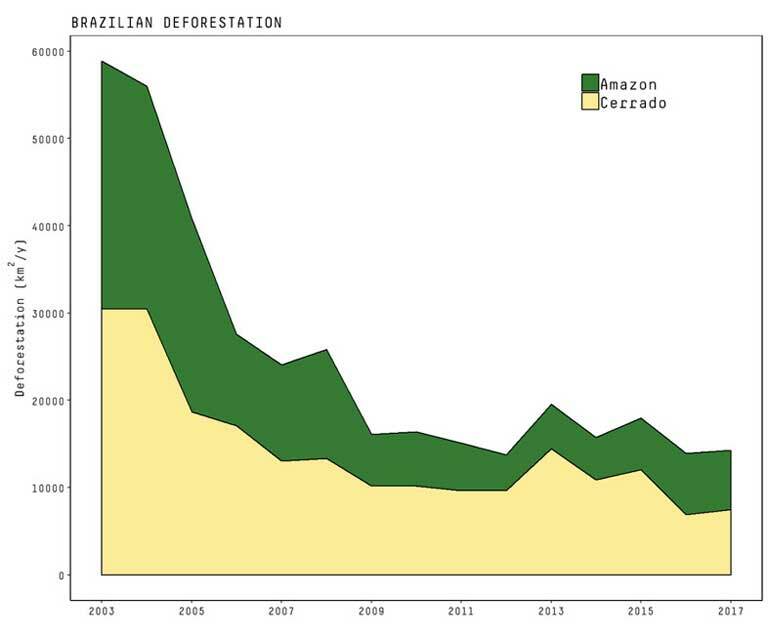 Data released by Brazil’s Ministry of Environment (MMA) and the Ministry of Science, Technology, Innovations and Communications (MCTIC) as part of their Prodes satellite deforestation monitoring program shows that 220,000 square kilometers (85,000 square miles) of native Amazon and Cerrado vegetation were cleared in Brazil between 2006 and 2017. During that time, the Cerrado experienced almost twice the deforestation rate of the Amazon, despite being less than half the size. An analysis of the latest Prodes data using the Transparency for Sustainable Economies (Trase) platform – jointly developed by SEI and Global Canopy in 2016 – found that around 10 percent of that land deforested between 2006 and 2017 was used to grow soy. 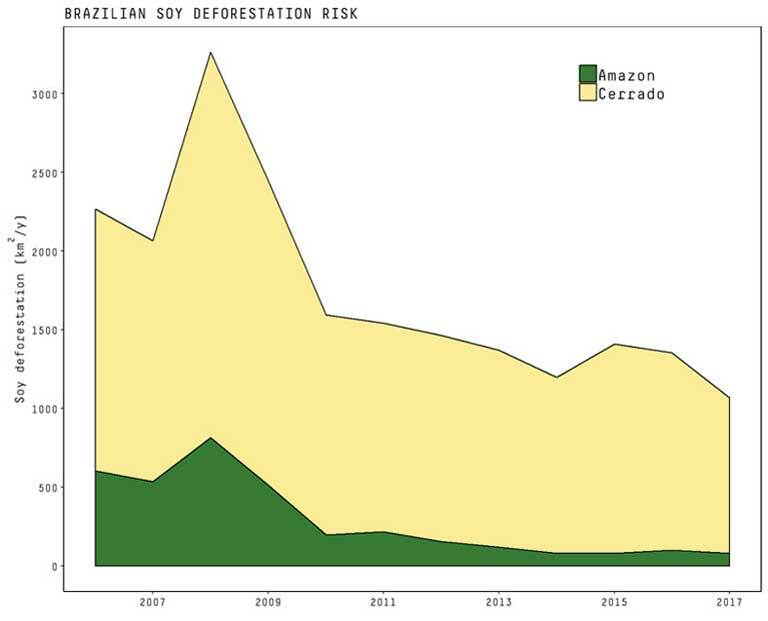 Trase uses computer modelling of market research data to infer commodities supply chains from source to market, in order to link environmental harm, including deforestation, at the local point of origin to companies and importing countries. The combination of soy plantation maps produced by agricultural mapping company Agrosatelite with Prodes data on deforestation patterns revealed a 5-year delay, on average, between deforestation appearing in satellite imagery and soy being planted on the cleared land. Often livestock are grazed on freshly deforested land while landowners prepare infrastructure and raise capital to plant soy; however, on some occasions land is cleared in order to be sold or rented immediately to soy farmers. “Current deforestation rates in the Cerrado are as alarming as deforestation rates [were] in the Amazon in 2006,” says Toby Gardner, Trase director and Senior Research Fellow at SEI. But it’s not all bad news: the MMA and MCTIC report that only 6,657 square kilometers (25,70 square miles) of Cerrado were newly cleared between August 2017 and July 2018, the lowest 12 months on record, dating back to 2001. “Deforestation in the Cerrado is declining compared to the early 2000s,” agrees Gardner, “but it is still very high,” with an estimated 140,000 square kilometers (54,000 square miles) of the biome cleared between 2006 and 2017 – an area roughly equivalent to the size of Nepal. The Brazilian Government attributes the slowing of Cerrado deforestation to the MMA’s 2010 Action Plan for the Prevention and Control of Deforestation and Forest Fires in the Cerrado (PPCerrado), a collection of initiatives aimed at curbing deforestation and burning of the Cerrado. But Gardner argues that crop failures in the Cerrado, brought on by increasingly dry conditions, are at least partly responsible for the deforestation rate slowdown. “While less deforestation is a positive thing, it is difficult to disentangle this from the bad farming conditions experienced in the last years,” he explained. If the recent rates of Cerrado deforestation continue, the impact on ecosystem services would be “devastating,” predicts Tim Pearson, an ecosystem services and carbon specialist at Winrock International, an NGO. The Cerrado is not only a biodiversity hotspot, but is also known as Brazil’s “Birthplace of Waters,” it being the source of three major aquifers and eight of 12 of the nation’s major rivers, including the Guarani, Bambuí, Urucuia, Paraná-Paraguai and São Francisco rivers. Further conversion of native vegetation to agribusiness cultivation could have severe downstream effects including national water shortages, “increased erosion, increased run off of fertilizer, pesticides and herbicides,” said Pearson. The scale of deforestation in Brazil’s carbon-rich Cerrado savanna is also of particular concern for global greenhouse gas emissions. Clearing native vegetation releases greenhouse gases, while crop plantations absorb less CO2 from the atmosphere than do native plants – a one-two punch hampering efforts to curb climate change. The United Nations Committee on Climate Change (UNFCC) estimates that conserving tropical forests (and their carbon-storing abilities) could provide “one third of the climate solution” over the next two decades. But achieving that goal would require putting a brake on the conversion of native vegetation to agriculture. Currently, agribusiness expansion for commodities like soy, beef and palm oil is responsible for roughly two thirds of deforestation in the tropics. 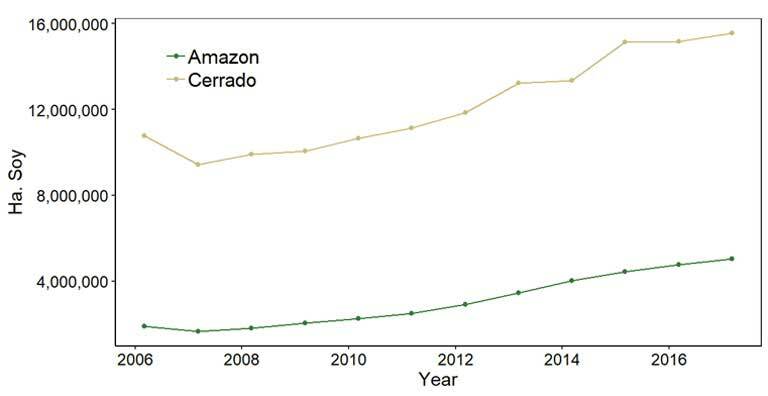 Utilizing the new Prodes satellite data, the Trase team was able to estimate the greenhouse gas emissions resulting from soy-driven deforestation in Brazil, which Gardner says represent “the lion’s share of emissions associated with most [supply chain] end products” sourced from the Cerrado. 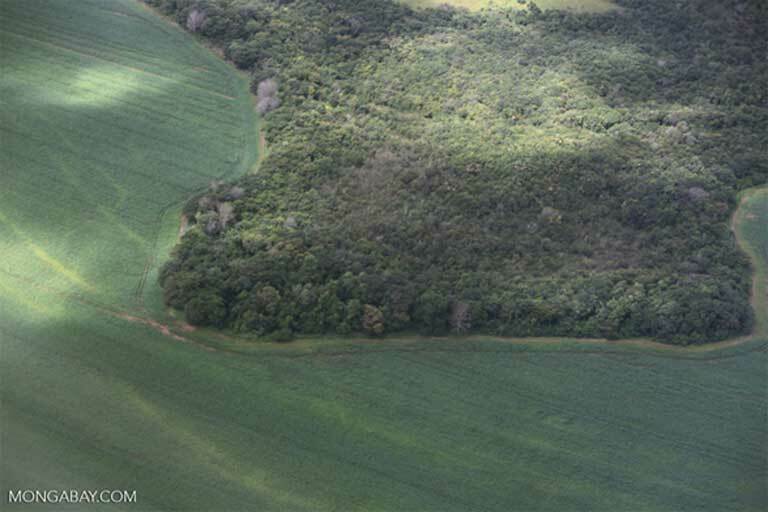 The team estimates that clearance of native vegetation for soy plantations in the Cerrado released 210 million tons of carbon dioxide equivalent emissions (CO2e) between 2006 and 2017. “It is useful and important to see what the impact of habitat loss is on greenhouse gas emissions and who downstream [in the supply chain] is inadvertently driving both habitat loss and emissions,” said Pearson. According to Trase’s analysis, transnational commodities companies Bunge, Cargill and ADM were the three biggest soy exporters from the Cerrado in 2017. Together the three traders exported 13 million tons that year – the production of which was associated with the clearance of 168,000 hectares (648 square miles) of Cerrado vegetation. This harm comes despite the companies having made voluntary commitments to zero deforestation. In response to a request for comment, Bunge reaffirmed their commitment to eliminate deforestation from their supply chains. “We are making progress on our three-part strategy to increase traceability and supply chain monitoring, facilitate smarter future investment through decision support tools, and develop incentives for farmers who conserve land.” Cargill and ADM could not be reached for comment. In February, six major commodities traders – Bunge, ADM, Cargill, COFCO International, Glencore Agriculture and Louis Dreyfus – pledged to monitor and report their soy purchases from 25 “high risk” Cerrado municipalities as part of the Soft Commodities Forum (SCF), a global platform for commodities traders convened by the World Business Council for Sustainable Development (WBCSD). The first soy supply chain reports are due for release in June. Pearson says he still has faith in zero deforestation commitments as a tool to improve sustainability in supply chains. “They may not be perfect but they create a public position… something companies have to live up to or face backlash.” However, Gardner warns that as deforestation is reduced, companies and consumers must also be willing to pay more: “More investment is needed and ultimately I don’t think we can deliver on zero-deforestation commodities unless they become more expensive,” he said. Progress may be just around the corner for creating real market incentives so that producers refrain from clearing Cerrado habitat. The Brazilian Soy Traders Association (ABIOVE) is thought to be close to negotiating a deal with a group of twenty-tree companies that have pledged support for halting deforestation in the cerrado, to contribute to a fund that would offer incentive packages for farmers to produce zero-deforestation soy. Also helping producers make better, more informed, decisions related to deforestation, The Nature Conservancy (TNC), an international NGO, in 2017 released Agroideal, a tool to assess the potential economic reward and socio-environmental impact of a soy plantation at a particular location. 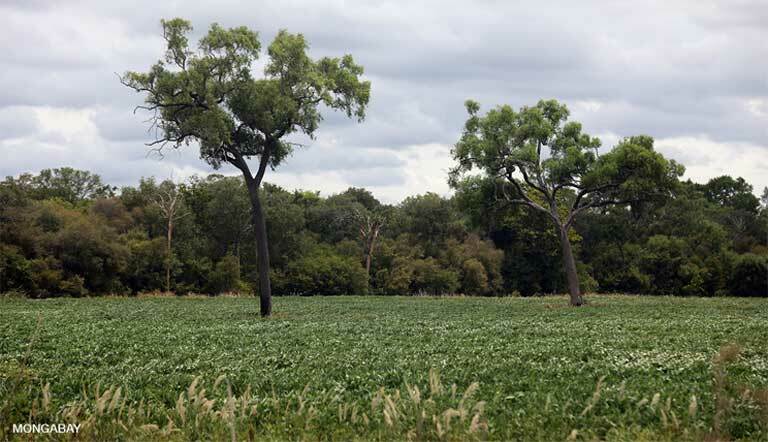 Partners to the project include Bunge, Cargill, ADM and Amaggi – all major players in the Brazilian soy trade that have made commitments to zero deforestation. Last year Bunge jointly developed a financing program with Santander bank and TNC offering 10-year loans to soy farmers who avoid converting native habitat for their plantations. “There is a critical momentum behind many private sector actors starting to take the [conservation of the] Cerrado more seriously, with an increasing number being prepared to help foot the bill for the shift to more sustainable production practices,” said Gardner. 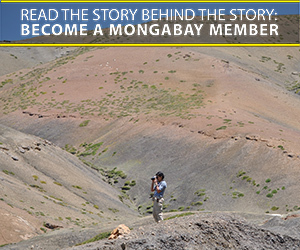 However, there are powerful forces at work that could hinder these efforts. U.S. President Donald Trump’s ongoing trade war with China – a country that purchased 59 percent of Brazil’s soy harvest in 2017 – has caused soy prices in Brazil to rise. Trase has since linked a trade war-induced spurt in soy production to 460 square kilometers (177 square miles) of deforestation and 5.6 million tons of CO2e emissions. Whether or not this particular boom in soy production and deforestation will continue largely depends on how U.S./China trade talks progress in 2019. 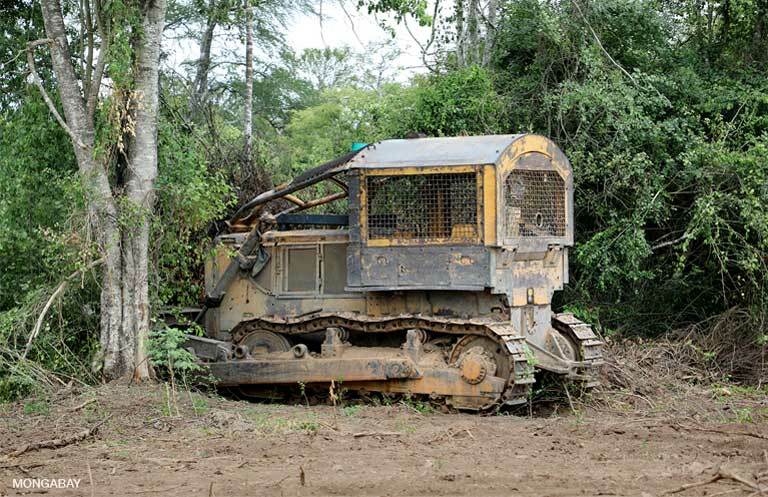 Under the newly instated Bolsonaro administration, a strengthened agribusiness lobby combined with a weakening of the environment ministry and of enforcement agencies could mean that existing deforestation laws, especially Brazil’s Forest Code, could go increasingly unenforced. In addition, no tough new environmental laws are likely to pass soon. 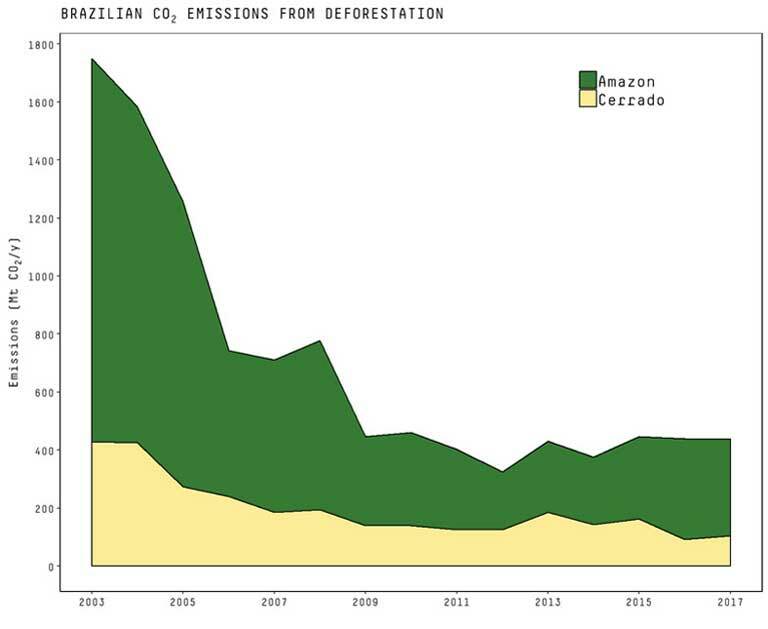 “In the Bolsonaro era, economic incentives combined with market pressure and market intervention are perhaps our greatest hopes” for curbing deforestation, said Gardner. 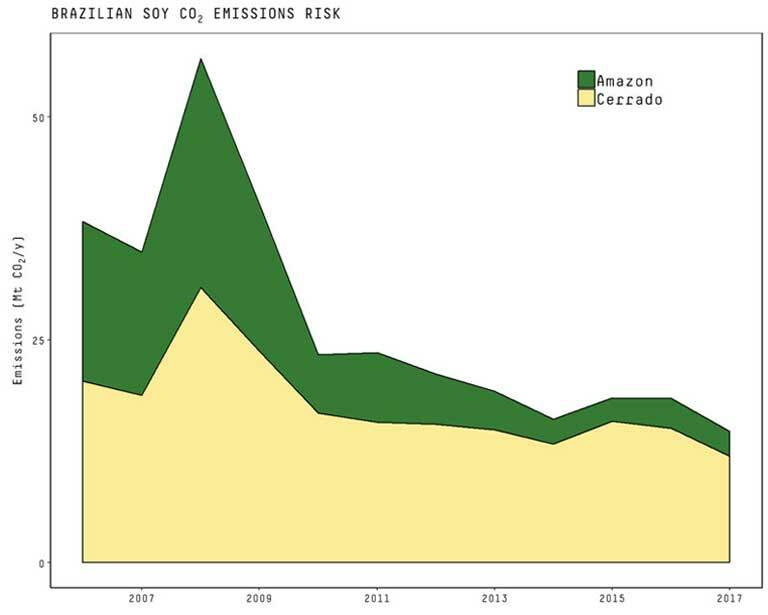 New data on Trase shows soy trade from Brazil’s Cerrado driving climate emissions Trase, December 2018.